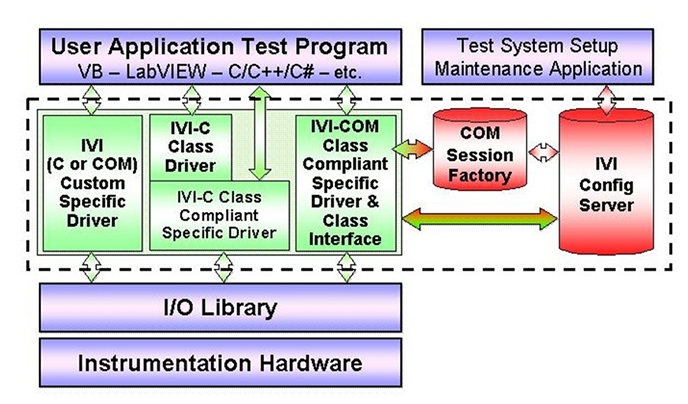 The IVI standard is an open driver architecture set of instrument classes and shared software components defined by the IVI Foundation. IVI drivers provide increased performance and flexibility to test instrument applications and define advanced features such as instrument simulation, state caching, automatic range checking, and multithread safety. The IVI Specifications define two types of drivers, class-compliant drivers and custom drivers. Class-compliant drivers comply with one of the eight instrument classes currently defined by the IVI Foundation (DMM, oscilloscope, arbitrary waveform/function generator, DC power supply, switch, power meter, spectrum analyzer, and RF signal generator) and share a common application-programming interface (API). Custom drivers comply with the IVI architecture but implement a custom API for an instrument that does not fit within one of the instrument classes specified by the IVI Foundation. IVI drivers can be implemented based on one of two architectures – IVI-C (based on the industry-proven VXIplug&play specifications) and IVI-COM.